Asus has a very small budget range of laptops, preferring to sell into the high-end market. That said, the Asus F5SI (£469 inc. VAT) has the look of the more high-end machines, but is made from more entry-level materials. The chassis is made from plastic with a dull metallic look to give it the appearance of brushed metal. The lid incorporates a 1.3-megapixel webcam that can be rotated 180-degrees for use in conference calls. The overall build quality is above average, as the compact chassis feels robust and solid to the touch. Sadly, this quality is not followed through across the entire laptop. The screen is a 15.4-inch Super-TFT panel that has a relatively small viewing range. When on mains power, we found it a bright screen to view, but it proved less effective when running on battery power. This is largely due to the left-hand side of the screen being duller than the right, which casts a slight haze over the panel. That said, the white balance was better than on many rivals. However, this machine will prove most effective if used predominately on mains power. The keyboard is also less than ideal. The keyboard itself is of a good size and sits to the back of the main body. However, we found the keys tended to rattle as we typed and felt loose in their mountings. It's not an uncomfortable keyboard to use, it merely lacks the overall quality of the keyboards on other machines. The touchpad is responsive and the single-strip mouse button offers dual-click functions as normal and works exceedingly well. 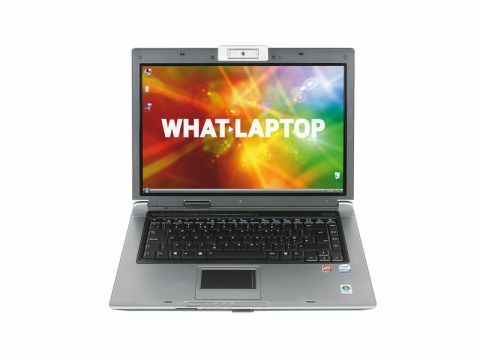 When it comes to specification, this laptop offers a good deal for the asking price. Powered by an Intel Core 2 Duo T5550 processor, performance is ﬁne for everyday tasks. This is a budget chip of the Core 2 Duo family, so you won't be able to run multiple applications without lag. This is largely due to the processor, but also the lack of memory, as the F5SL ships with only 2048MB of memory. This is enough to handle the Windows Vista Home Premium OS, but leaves little headroom to run more complicated, or multiple, programs with ease. The 250GB hard drive offers plenty of space for your ﬁles. Connectivity is average and doesn't offer anything out of the ordinary, other than four USB ports. The Asus F5SI is a reasonable machine considering its price, but it is easily overshadowed by other rival laptops. The keyboard and screen lack build quality and, while performance is acceptable for the price, you will need to add extra memory and a larger hard drive to make the most of this laptop.